A friend, Dr. Jonathan Salvacion, posted some photos of a trip he made to Marinduque. 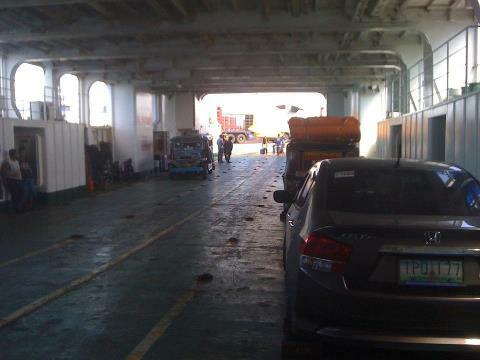 I noticed a couple of photos showing the ferry their group took between the Port of Lucena and Marinduque Island. After getting his permission to use the photos, I am post both here to show the typical ferry used in inter-island, roll-on roll-off (RORO) transport in the Philippines. Being an archipelago, providing safe and efficient inter-island transport is a continuing challenge for the country. A lot of progress, though, has been made regarding infrastructure and services. The improvements include the nautical highway system comprised of highways and seaports where the past and present administrations have invested heavily during the past decade. By d0ctrine in Maritime transport, Ports on April 5, 2013 .